If you need an idea for a cute and easy teacher gift, try filling this fun gift bag with some yummy treats. Your child’s teacher will love receiving not only the gift inside, but the packaging will make her (or him) smile! To create this bag first cut two 2″ circles (from white or ivory solid cardstock) and two 2 1/2″ circles using the Magnetic Circle Cutter. Then cut an oval shape (about 3″x4″) and a diamond shape for the beak. 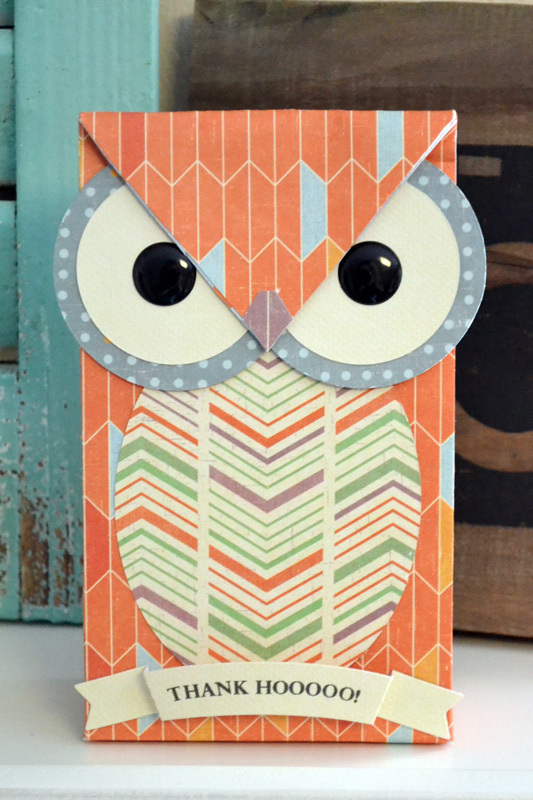 Next, make a gift bag using the Gift Bag Punch Board. I cut my paper to 10″ high and 12″ long and used the large measurements on the punch board. 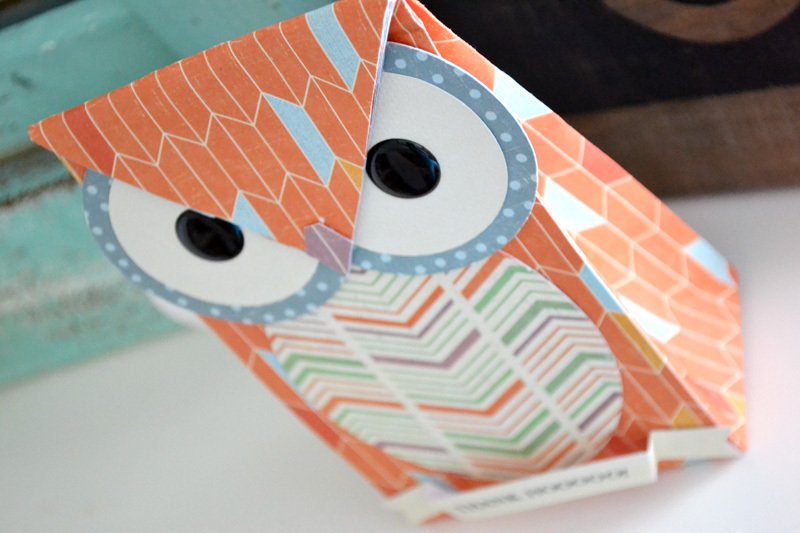 Don’t punch the holes in the top with the reverse punch so you can fold the top down to make the owl’s head. 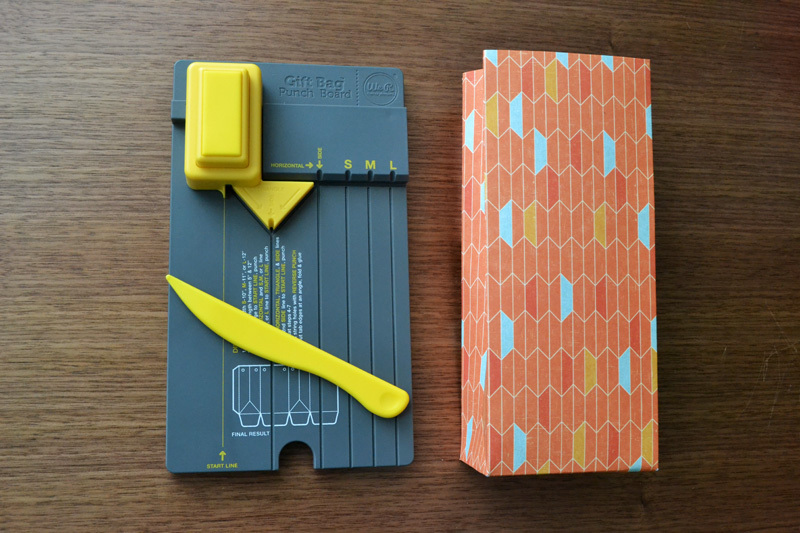 Score and fold the top of the gift bag at about 2 1/2″. Find the center of the top edge and cut from there to the corners of the fold to create a “v” shape as shown. Fill your bag with goodies or a present for your child’s teacher and then secure the folded top so it stays down either with a staple or repositionable adhesive so the teacher can open it. Piece together the eyes, belly, and beak as shown and add them to the front of the bag. Add Enamel Dots or Brads for eye centers, and a sentiment at the bottom. If you’d like to use the same sentiment I did for my bag, you can download a free printable template HERE. Designer tip: if you have the Drink Sleeve Template Die you can use the 3D banner die to cut out the sentiment on the printable template; or you can cut with your scissors along the solid lines and fold along the dashed lines. This fun beach layout of mine was up on the Echo Park Paper blog yesterday. I used the journaling cards included in each collection to create this block style page about our trip to the beach for spring break last year. Using the journaling cards made this layout come together so quickly! Just like I would with my pocket scrapbook pages I treated each journaling card as a mini canvas and added simple embellishments. 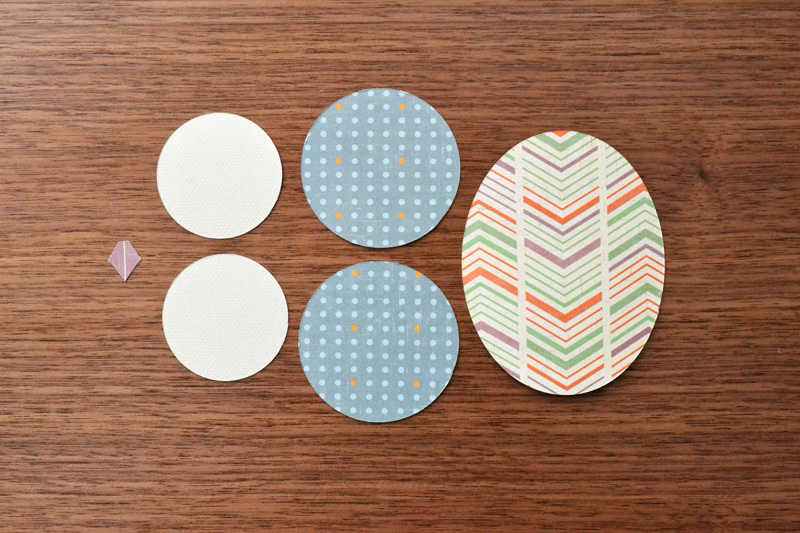 The EP elements stickers and decorative brads coordinate perfectly with the paper--easy peasy! To give the layout a more playful feel I added some ink splatters to the background of the page before adding my photos and journaling cards. For full supplies check out the Echo Park Paper blog HERE.